Philip Oppenheimer, callsign ‘O.P.’, is an Advanced Instructor Pilot and Master Certified Flight Instructor for Aviation Performance Solutions, LLC (APS). The breadth and depth of his flying experience has provided a strong foundation to pursue continuing advances in the unique flight training that APS has developed, as well as expanding the delivery of their advanced pilot training techniques. Mr. Oppenheimer joined APS in 2001 after a distinguished 20 year career in the US Air Force, collectively bringing him to over 35 years of flight operations and training experience as a pilot and aviation manager. Lieutenant Colonel (Ret) Philip ‘O.P.’ Oppenheimer was raised in Mahopac, NY. He received his USAF commission from the ROTC Program, Texas A&M University in 1979 along with a BS in Education, Curriculum and Instruction, Math and Physics and in 1996 received an MA- in Military Studies (History) from American Military University. O.P. completed Undergraduate Pilot Training at Vance AFB, OK, flying the T-37 and T-38. His operational flying assignments included flying the A-10 at Myrtle Beach, SC; the A/OA-37 at Howard AFB, Panama; the F-16A/B and F-16C/D at Hill AFB, UT; and F-16C/D at Luke AFB, AZ. During his F-16 tour at Hill AFB, O.P. deployed in support of Operation DESERT SHIELD and flew 28 missions and 136 combat flight hours in support of Operation DESERT STORM. Non-flying assignments included in-residence Air Command and Staff College at Montgomery, AL and J3 Current Air Operations Officer at US Central Command, MacDill AFB, FL. During his 20 year Air Force career, O.P. was a military formal course and line operations instructor pilot and flight examiner in the A/OA-37 and F-16. O.P. 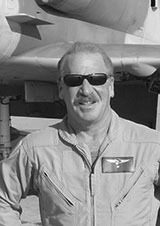 also served as squadron chiefs of mobility, scheduling, training, standardization and evaluation (Stan/Eval), flight commander, wing assistant chief and wing chief of Stan/Eval, squadron assistant operations and operations officer, joint current air operations officer and culminated as the commander of the 309th Fighter Squadron (F-16). Following his military career, O.P. retired from the Air Force in 2001. He has worked for Aviation Performance Solutions as an Advanced Upset Prevention and Recovery Training Instructor since March 2001, and since joining APS, Mr. Oppenheimer has been a valued ground and flight instructor resource in helping to build APS’ UPRT program to include development of the original academic Powerpoint briefings and writing articles dedicated to improving pilots’ skill sets in time-critical, life-threatening situations. He also coordinated, developed the curriculum and flight profiles, provided ground training and flew as an instructor in the A-4 (and Alpha Jet) High Altitude UPRT Program(s) in support of the overall APS UPRT Program. From 2001 through 2007, O.P. was also a Beechjet Captain (FAR Part 135) for Southwest Jet Aviation, Scottsdale, AZ and performed contract flying (FAR Part 91) in the King Air B-200. He also flew for DMB Real Estate Development Corporation/Dorrand Aviation (Scottsdale, AZ) as a Part 91 contract pilot on the Citation XL and Citation X. In addition, from 2001 through 2016, O.P. flew and dropped on fires throughout the western US and was a qualified Department of the Interior/Bureau of Land Management (USDOI/BLM) Level I Single Engine Air Tanker (SEAT) Pilot/Instructor Pilot for Western Pilot Service, Phoenix, AZ and M&M Air Service, Beaumont, TX. Aircraft flown included the M-18 Dromader, S2R-G10, S2R-T45, S2R-T660, Air Tractor 602 and 802. From 2002 to 2017 O.P. was also the Chief Pilot and Director of Flight Operations, Chief of Safety, Chief of Stan/Eval, Chief of Scheduling and Training for Top Aces Corp, Mesa, AZ and was an A-4 and Alpha Jet formal course Instructor Pilot (IP), Check Airman, Transport Canada Designated Pilot Competency Check (PCC) Flight Examiner (A-4), and A-4 Functional Check Flight (FCF) Pilot. Since 2002, O.P. has also been the President of OP Aviation & Consulting, LLC. He was an FAA Aviation Safety Counselor (2002-2005); Aviation Safety Consultant and Aerial Firefighting Operations Risk Management (ORM) Instructor for the USDOI/BLM National SEAT Academy, US Forest Service, National Aerial Firefighting Academy/National Aerial Firefighting Resource Institute (NAFA / NAFRI); ORM Instructor for the Arizona Department of Game and Fish. He also owns an Extra 300L, Cessna T-207 and Cessna 180H. O.P. also worked for the Rickard Consulting Group (2004-2007) as a contractor consultant and F-16 Subject Matter Expert and Simulator IP at the USAF Research Laboratory (AFRL), Mesa, AZ. 2016 Authored article “A-4 Skyhawk High Altitude Jet Upset Recovery Training” published on the APS Website.